Saturday will be a beautiful day with low humidity and plenty of sunshine. Temperatures will be in the lower 80s. Watch out for rip currents at area beaches. Sunday will be windy, but dry and mostly sunny. Temperatures will be in the mid to lowers 80s. The start of the work week will be quiet but breezy. 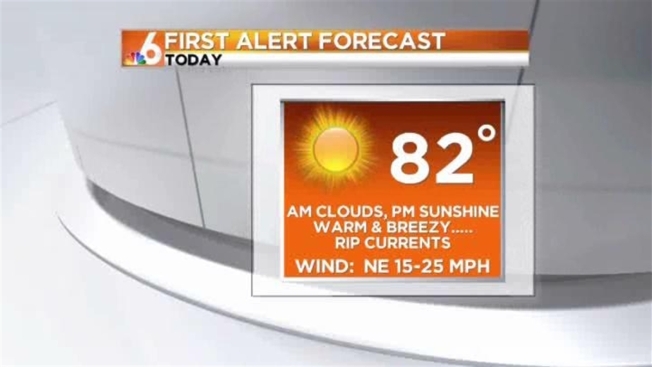 Temperatures will be in the mid-80s under mostly sunny skies. Lighter winds by the end of the week will allow temperatures to warm to the upper 80s for the second half of the week. Expect rain-free skies through next weekend.